Two thousand years before Dante, Michelangelo and the Medici of the Renaissance, the extraordinary Etruscans civilized Central Italy. Etruscan gods, ancestors, prince-priests, augurs, nobles, artisans and servants all have a story to tell. At the height of their unique society, they lived surprisingly in tune with 21st century values and attitudes. "Delight in life!" The Etruscans said. Gifted with stamina and laughter, wickedness, greed and grief, their life journeys evolved. Family patriarch, Vel the Soil Sampler, traipses high mountains to discover precious rocks and minerals, bringing great wealth to rivals: Zilath of Tarchna, and Maru of Cisra. Wise Anneia the Healer, risks her life to cure the sick with herbs and poultices. Wanton beauty, obsessive Noblewoman Arith, connives to win fame and fortune. Noble child Venu’s fate is sealed when he is caught aboard a merchant ship that sails to Eastern Mediterannean ports. Neglected homemaker, wife and mother, Noblewoman Risa’s destiny is guided by a haruspex, a tomb painter and The Flutist. 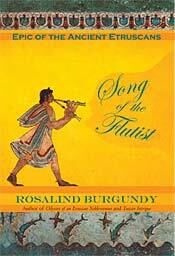 Read about these brilliantly clever Etruscans in Song of the Flutist. “Speak louder,” Anneia’s voice floated at him, compressing the moonflowers to his mutilated body. “Old as night, young as dawn,” she said, her face near his. Her fingertips traced the lines of his wounded face and stroked his forehead. Desperately, Vel wanted to live to see her again. Her smiles lit his being. Her touch melted his self-importance. Never before had he such comfort with a woman.